Portfolio Based Language Assessment (PBLA) has created a new world, where the doing of tasks is a must, with no exceptions whatsoever. The first thing that comes to mind when you hear the word task is the notion that you have something to do, most likely something you are not too keen on doing. A task by any definition is a piece of work you must do or undertake. The Merriam-Webster dictionary goes further to add: “Something hard or unpleasant that has to be done.” Some common synonyms for the word task are chore, job, duty, labour, toil, and burden. 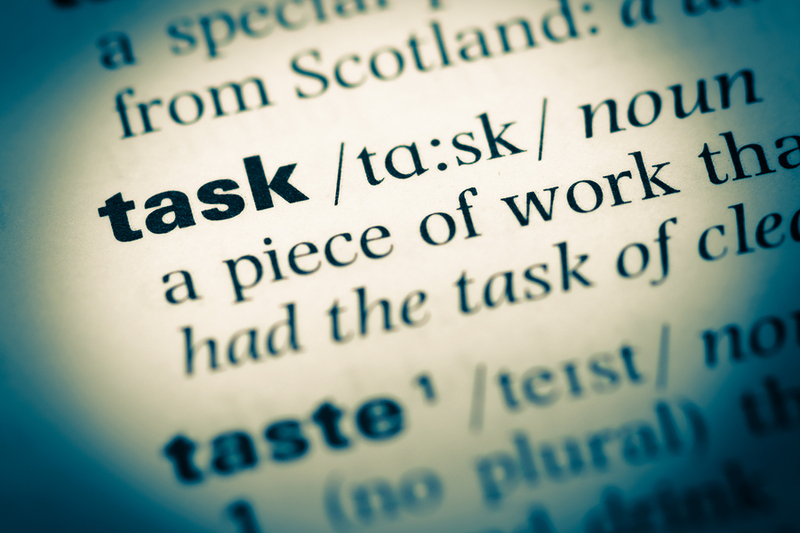 Both as a noun and a verb, the word task does not evoke anything pleasant someone has to do. How the word task came into adult ESL teaching methodology now troubles me. There has to be a better word than task to represent the activities learners need to do. For over a year now, I have been attending courses, workshops, discussion groups, and webinars on PBLA, the Citizenship and Immigration Canada (CIC) funded programme for all ESL non-credit classes in Canada. The heart of PBLA is “teacher administered assessment tasks” (Pettis, 2015, p. 7). Every material from the Centre for Canadian Language Benchmarks (2012a; 2012b), which oversees the PBLA programme, says its standard is task-based. Tasks are now undoubtedly in. In all the PBLA-related sessions I’ve been a part of, I haven’t heard anyone, or read anywhere, call the word task into question. I myself did not question the word task when in an earlier blog post in this forum, I advocated the need to “do task-based needs analysis to see the target tasks (real world things) learners need to do to match with their learning goals” (Lakhan, 2017). On the way to work on the first day of class this September, while mentally trying to figure how I will start my new term, officially introducing PBLA, it struck me, somewhat fearfully, that I will have to tell my adult learners, mostly seniors, that they will have to do tasks. There and then, and lo and behold, tasks suddenly became, to me, dreadful chores and awful burdens. I survived explaining to my learners that we will do lots of assessments, not assessment tasks, as it is written in the PBLA holy book. A task-based teaching approach may be the best way to enhance learning, but I find it hard to tell my learners that they have to do tasks. The word task is imposing and demanding. I consoled myself by telling myself that many would point out that nothing is wrong in having learners doing something that seems demanding to achieve their language goals. But I keep asking myself, to this day, should that something be called tasks? I thought I had missed something about the use of the word task in the teaching of ESL. So I did some research. There are endless definitions of tasks in language teaching and learning. There is also a world of information on task-based learning (TBL) and task based language learning (TBLL). Then there is also pedagogic tasks, task types, task design, task syllabus, and the list goes on and on (Essays UK, 2013). I can’t find as yet how the heart of PBLA came to be “teacher administered tasks.” I found, however, how the word task came into the second language acquisition methodology and practice. Not too long ago, when second language acquisition researchers were trying “to elicit samples of language use” (Ellis, 2004, p. 1) among students, they gave them tasks, work to be done, burden and toil to bear. However much the word task is now being sanitized, it is still work to be done. And, of course, I have yet to see anyone saying that doing tasks is part of their educational philosophy. Ellis, R. (2004). Task-based language learning and teaching. Oxford, England: Oxford University Press. Pettis, J. C. (2015). Portfolio-based language assessment (PBLA): Guide for teachers and programs (2014 ed.). Ottawa, Canada: Centre for Canadian Language Benchmarks. After completing his TESL Instructors’ Course from the Ministry of Citizenship in 1991, Sridatt started as an ESL instructor with the Toronto District School Board. He has a BA from the University of Guyana, an MA from the University of Windsor, and a BEd (Adult Education) from Brock University. He has written extensively for a number of publications including peer-reviewed journals. Hi Sriddat. While I appreciate your musings, I don’t understand what conclusions can be drawn from this post. You talk about the various connotations of the word “task”, but I fail to see a statement or conclusion. Are you stating that if we replace the word “task” with another word, it changes the nature of PBLA or your perspective on it? I am not trying to be confrontational or “call you to task” lol, but because I myself am an opponent of PBLA’s “task-based” teaching methodology, I would like to read the views of others. Do you have a stance on PBLA’s Real World Tasks? Thank you. Thanks for your keen observations; I really like them. To simply answer your question, I think that both tasks and PBLA should be abandoned when it comes to teaching adult language learners. Both are useful in trades/industrial school settings. A competency based, task based, portfolio based method is well-suited for fields that require an accumulation or completion of a specific number of “tasks.” The training of a police officer or a gas fitter requires the completion (competency) of a number of tasks(artefacts) in a binder(portfolio).